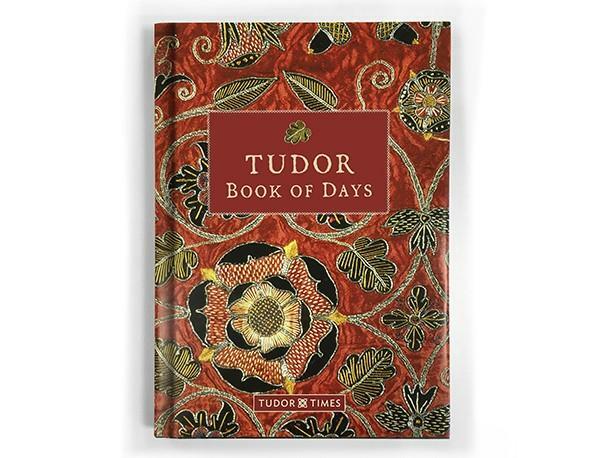 You won’t forget the first time you hold the Tudor Book of Days, that’s for sure. What a remarkable publication this is from the folk who run the ever-growing Tudor Times empire. Solidly bound with a stunning cover featuring depictions of embroidered Tudor roses, I fell in love with the book before I’d even opened it up. But first, some context – what exactly is a Book of Days? Well, its based on the Book of Hours, a literary item often owned and used by the great and good of the medieval and renaissance period to aid lay people in practicing their religion to utmost of their ability, such as serving as a remainder of important feast days or to collect biblical texts, liturgies or prayers that could be used by the owner throughout the day. These books were very much a much-revered and highly sought-after fashion accessory at the uppermost levels of society, and were often individually commissioned, bearing the owner’s coat of arms or other family emblems. They were then passed through the generations. They were annotated when important events occurred, such as Margaret Beaufort marking in her Book of Hours when her namesake granddaughter was born in 1489. What the Tudor Times have done here, is replicate the idea of a Book of Hours but with a more useful, modern twist, coming up with the Book of Hours, creating a composite publication suitable for the 21st Century. 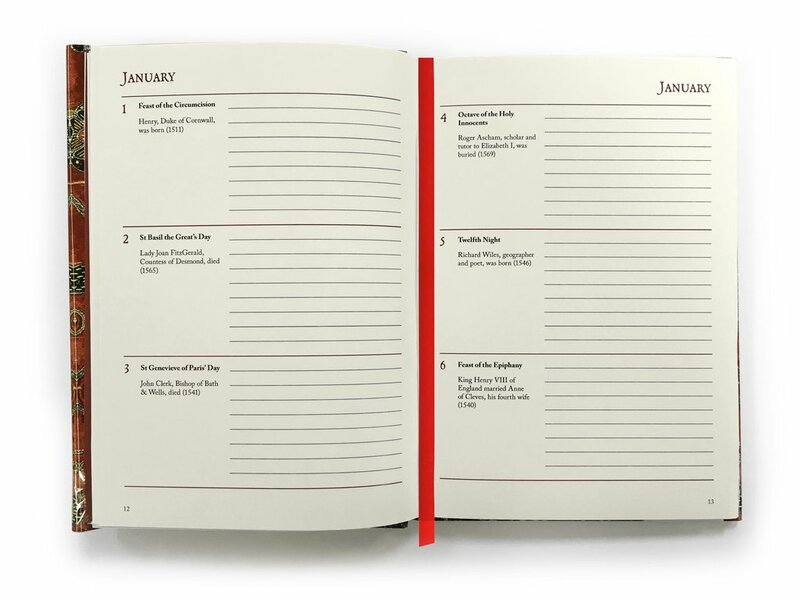 It is a perpetual calendar in planner format, allowing you to mark important recurring events, birthdays, holidays, anniversaries, meetings etc on the date they occur. This is a key selling point of the planner – days of the week (i.e. Saturday) and years (i.e. 2017) are not included, just the date (i.e. 15 January), allowing you to keep using this Book of Days for many years. It is not designed to have a 12-month shelf life, just like the original Book of Hours. Each page of the planner, therefore, has the date (e.g. 1 November), the feast day if one happens to fall on that date (e.g. All Hallows’ Day), a fact of history relating to that date (e.g. Edmund Tudor, Earl of Richmond, died 1456) and a space to jot down any thoughts or events you want marked yourself. At the start of each month is a summary of all historical facts for quick reference, and a section to write down all birthdays, anniversaries, reminders, project, occasions, festivals etc you want to note. Other helpful additions to the book, aside from its main section, are a page to input your personal details that you may refer to regularly, and an index of each figure featuring in the titbit of trivia throughout the book with short biographical details. In short, what the Tudor Times have produced here is a masterpiece, a unique but incredibly useful planner that will help any Tudor enthusiast navigate through the quagmire that is their day-to-day lives. An absolute must on the wish-list of any organised 16th century aficionado, and one I will personally be putting to very good use hereon in. Tudor Times is the place to go for a wide variety of information about the Tudor and Stewart period 1485 – 1625. On the website you can find material on People, Places, Daily Life, Military & Warfare, Politics & Economics and Religion. It features Guest Articles from well-known Tudor & Stewart historians. The site has a Book Review section, with author interviews and a book club. It also has comprehensive family trees, and a ‘What’s On’ event list with information about forthcoming activities relevant to the Tudors and Stewarts. Haha, I didn’t even finish reading this email before I was off to the website to complete a purchase of this Book of Days. The Tudorphile is strong with this one. lol. Thanks for sending out this notice! !